Ronnie Ellis drilled a three-pointer at the buzzer Wednesday to give the Phelps boys' basketball team a 65-62 victory over Hill School. Ellis ended with 15 points while Justin Anderson led the Lions with 16 points. Ralph Saint-Fleur hit a buzzer-beater in overtime as Dock Mennonite edged Chester Charter, 49-48. Saint-Fleur finished with seven points as Dallas Wilder led the charge with 13 points for the Pioneers. Bryce Spriggs scored a game-winning layup with seven seconds remaining to lift Friends' Central over Princeton Day, 61-59. Spriggs finished with 14 points while Edward Holland paced the Phoenix with 26 points. 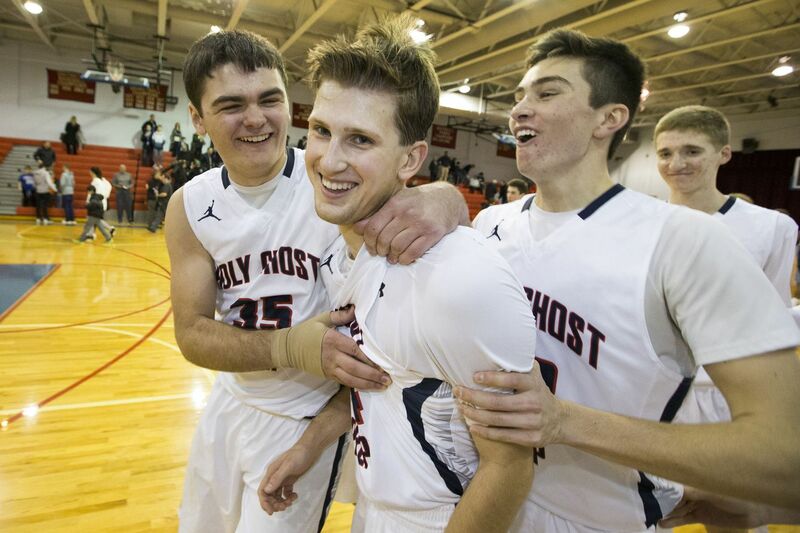 Sean Sylvester and Jack Rittenneyer scored 12 points apiece in Holy Ghost Prep’s 52-34 victory over Church Farm. Tyler Mish and Greg Calvin each pitched in 10 points for the Firebirds. Isaac Marshall led Academy of the New Church with 15 points in a 60-33 decision over Solebury School. Anthony McCall contributed 12 points for the Lions. Kevin Ngyen scored 12 points as Pennsylvania School for the Deaf beat Delaware School for the Deaf, 46-15. Jourdan Johnson led all scorers with 27 points as Constitution edged Franklin Towne Charter in overtime, 57-54. Parisha Blount added 12 points for the Generals. Carmen Williams scored 16 points to lead Penn Charter past Baldwin, 56-35. Kelsey Bess added 13 points for the Quakers. Jaidah Peterson-Miller scored a game-high 14 points as Lincoln topped School of the Future, 45-25. Janiece Ellerbee recorded a double-double with 25 points and 12 points as Dobbins defeated Motivation, 49-32. Phyllis Fugah poured in 27 points as Paul Robeson took down Ben Branklin, 73-48. Tyheera Hand chipped in 22 points for the Huskies. Ashjanelle Wilson finished with a game-high 20 points in Audenried’s 53-30 win over Central. Taliyah Rahman contributed 16 points for the Rockets. Ciani Newsome and Jaylah Robinson each had 14 points as Mastery North beat Mastery South, 56-13. Angela Sanders pitched in 10 points for the Pumas. Madison Brady’s 11 points and Casey Bivenour’s 10 points lifted Phila. Academy Charter over Overbrook, 36-28. Zoe Hargrove and Jo Morrison combined for 46 points give GAMP a 59-42 triumph over Swenson. Azori Edwards netted 21 points in Freire Charter’s 70-30 victory over Prep Charter. Monet Cummings added 18 points for the Dragons. Jayla Lawrence and Janiyah Greer each tallied 13 points as Roxborough knocked off Sayre, 60-38. Kayla Faulk, Ayania Singleton, and Asjah Thomas had 10 points apiece for the Indians. Ellie Benedict notched 15 points in Palumbo’s 48-29 triumph over Bodine. Kaela Wilson added 12 points for the Griffins. Eliza Murphy scored a game-high 16 points as Masterman got past Parkway Northwest, 41-38. Rosin Keenan chipped in 10 points for the Blue Dragons. Gia Digiacomo had 13 points in Pennsylvania School for the Deaf’s 35-13 win over Delaware School for the Deaf.